Henare Walmsley, Te Kahu o te Rangi Māori Pastoral Care Team of the Archdiocese of Wellington, introduces Te Wiki o te Reo Māori Language Week for WelCom. E te tī, e te tā kua tae nei I raro I te maru o Matariki roa, Matariki hou mai, Matariki okioki atu, Tihei Mauri Ora. E te Atua Matua kaha rawa, nāu I whakairo te ao tangata. Nō reira, e te Atua, kororia ki tō ingoa tapu. Me maumahara ana hoki I ngā mate kua wehe I te pōuriuri, te pōtangotango, te pō o Hinenui, Haere, haere, haere oti atu rā. Ko Tā Latimer Mangainui o Te Tiriti tērā I maumahara, kore e mātou kia wareware. ēnei kupu whakamihi āku ki a koutou ngā tae o te whenua. Tēnā koutou katoa. As time reaches the longest of nights and the shortest of days we remember those who carried the burden of a nation. Striving to add light to a multiplex society with their definition of ‘Treaty’ in a modern world; the late Sir Graham Latimer, or Tā Kereama Ratima, was a pioneer in cultural acumen, deliberating between the tides of political power and social desires. His commitment to Māori also helped the establishment of the Māori Language Commission forged by the enactment of the Māori Language Act in 1987 for which Tā Kereama was a primary driver of. From that day Te Reo Māori was recognised as the official language of Aotearoa New Zealand, and spawned the beginnings of Māori language organisations such as Te Mangai Paho, the Māori Television service, and the Iwi Māori radio network. This week (4‒10 July 2016) celebrates ‘Te Wiki o Te Reo Māori’ and 29 years on from the work by Tā Kereama Ratima and many other of our kaumatua and kuia. Perhaps this whakatauki (proverb) encapsulates the dreams of our forebears. ‘E kore au e ngaro, I ruia mai au I ngā kakano o Rangiatea – I will not be lost because the seeds have been sown by my ancestors’. In my mind the Catholic Church also provides maternal seeds to celebrate the Mass, not only in a Māori way but in a truly bicultural way. Many liturgical scripts now have Māori and English text. Te Reo Māori is prevalent in many of the Archdiocese of Wellington and the Diocese of Palmerston North parishes. Cardinal John Dew and Bishop Charles Drennan always recite a mihi or Māori greeting to the congregation at important events during the Catholic calendar year. 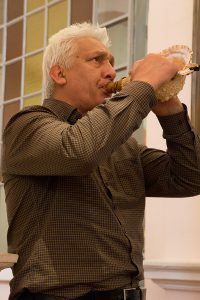 We, the Te Kahu o te Rangi Māori Pastoral Care Team, have been working with Fr Pat Bridgeman, parish priest of Te Awakairangi Parish, exploring Taonga Pūoro (Māori musical instruments) and waiata in the liturgy of the Mass. This becomes a wonderful carrier for the use of Te Reo Māori in the Mass to support welcoming events, blessings, and Liturgical and Eucharistic ministry. When pure song and pure word are blended, prayer is magnified. In light of the beatification of Mother Suzanne Aubert and her aspirations I am working with the Sisters of the Home of Compassion in developing Te Reo Māori within their communication programmes, social projects and religious celebrations. Simple email correspondence with salutations in Te Reo Māori provide a vital start to understanding the language. Te Reo Māori and Tikanga programmes with the Soup Kitchen staff and guests create a sense of community and well-being. The Home of Compassion regularly have Māori Miha (Mass) at their Island Bay Centre every Sunday at 11am. Mother Suzanne Aubert or Mere Hohepa as she is affectionately known is also present as a patron at Te Ngakau Tapu Māori Parish in Porirua with a regular Māori Miha there every Sunday at 10am. The church (next to Viard College) has a regular congregation singing waiata (Māori songs) and prayers in both Te Reo Māori and English. Taonga Pūoro and classic Māori chants are a main stay of the Sunday celebration. Nō reira, e ngā Rau Rangatira o te Motu, kia whakapainga tō koutou wairua tapu, tō koutou tinana me tō hinengaro hoki I raro I te maru o te Atua Matua Kaha Rawa. Tūturu o whiti whakamaua, kia tina, tina, hui e taiki e! Bind together the plaited ropes, pull tight and stand fast!